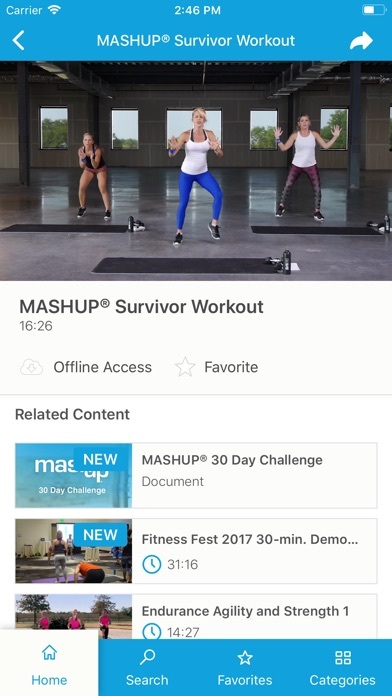 Get instant access to numerous 15, 30, and 45-minute MASHUP® workouts anytime, anywhere. With the MASHUP® app you can experience short, effective workouts with Variable-intensity Interval Training (VIIT). This research-based program features Mind/Body, Agility & Strength, and High-intensity Interval exercises for every fitness level for a fun and challenging workout! Workouts can be performed using bodyweight and a yoga mat. Other equipment is optional. New workouts are added every month. 1) $9.99 a month. This subscription will auto renew within 24-hours prior to the end of the time period. 2) $109.99 a year. This subscription will auto renew within 24-hours prior to the end of the time period.